A second draft of the project, before the yellow snouts and eyes, and with incorrect wings on the individual in the background. Li, Q. et al. 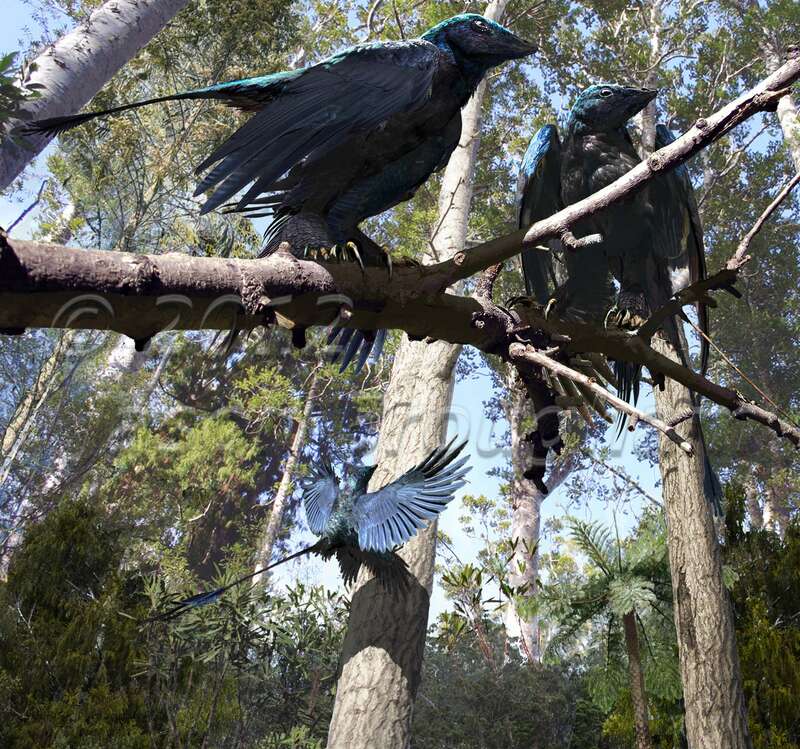 (2012) Reconstruction of Microraptor and the Evolution of Iridescent Plumage. Science, 335, 1215-1219. Now, Mick Ellison prepared a highly accurate and exceptionally accomplished reconstruction of the entire body of the new specimen after the entire team of paleontologists on the paper had given it a lengthy and critical investigation. Mick gave that illustration to me and my job was simply to learn the morphology from that and make it into a few individuals in a habitat. I say simply but Mick, Julia, Mark, and Jakob showed a lot of patience with my myriad mistakes and bad ideas. The images are just 2D Photoshop digital paintings / photocomposites. I actually started by drawing with pencil on paper, just to quickly lay out some composition ideas, and scanned those drawings as a beginning. But most of the work was on Photoshop, starting with photographs of feathers, going feather by feather, stretching, bending, angling, cutting, and painting over the top, building the feather arrays, flattening all that work into single layers, and then doing that again. Above all I kept going back to references of living birds. 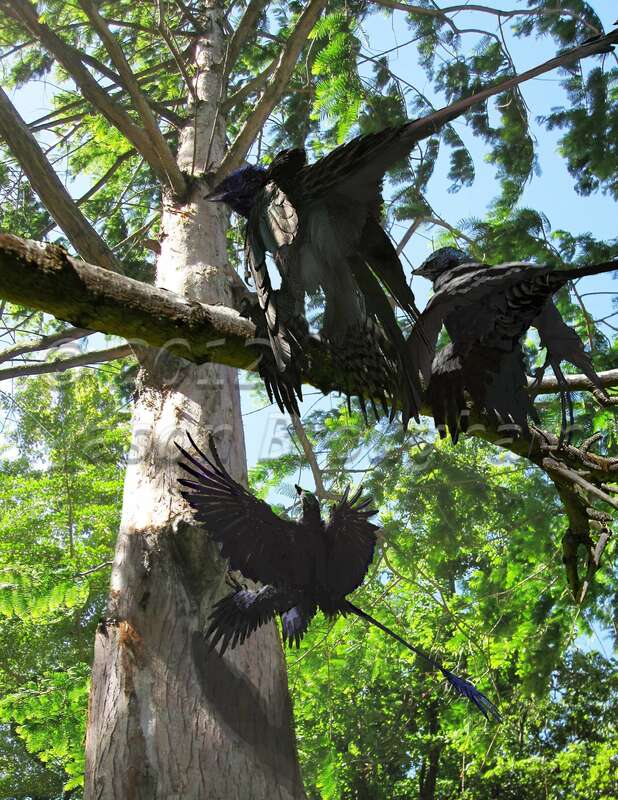 I kept looking at wildlife photos to see how birds look at one another and posture themselves when they are in flocks, how they approach walking on branches, and how they prepare to land on trunks. Then I would work backwards and take out advanced traits, like tightly folded wings or perching toes, when the consensus on the team was that those traits aren’t well supported for a more primitive animal like Microraptor. One challenge came in foreshortening – the tail plumes and metatarsal feathers can’t be shown flattened out for clarity, because then the animals would look like they’d been pressed flat like a brick chicken or something. These had to look alive, with all the foreshortening, blocked views, and disarray that that entails. So in the complicated cases I built actual models out of paper, feathers, brass rods, and plastic casts of my Microraptor skeletal reconstruction, and photographed them at the precise angle of view, in order to get the correct perspectival views. Some people have said the pieces, overall, look very realistic and that is kind. Myself I think they end up a little wonky in that weird way that digital painting usually does. I think what people like is actually the surface textures. I’ll tell you my secret there. I took photographs of actual bird specimens – grackles, crows, and drongos – and then warped them, cut them up, stretched them, and painted over them, to get them to fit as overlays on the feathering pattern worked out by Mick Ellison. 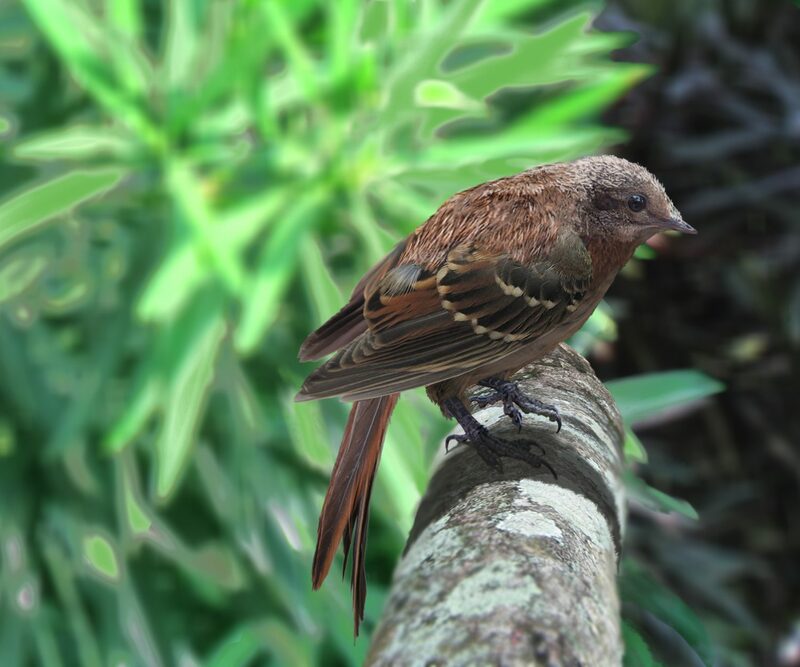 Then the iridescence had to be toned down (in the case of grackles) or intensified to make the different samples match one another, and I laid shading and highlights over the top. The first draft proposal. Everyone hated it. Why “soft” dinosaurs. What does that mean?